It’s taken a while, but it seems like specialty coffee is finally beginning to take root in Aberdeen. With proper, well-crafted coffee being served all over the south of the country, it felt a little like the north-east is too far north, too far east, for anyone to take the plunge. But slowly, we’re getting there. First there was Foodstory (who are currently expanding their upstairs, so probably overdue for another visit), then out in Udny the Coffee Apothecary, and now the Cult of Coffee. 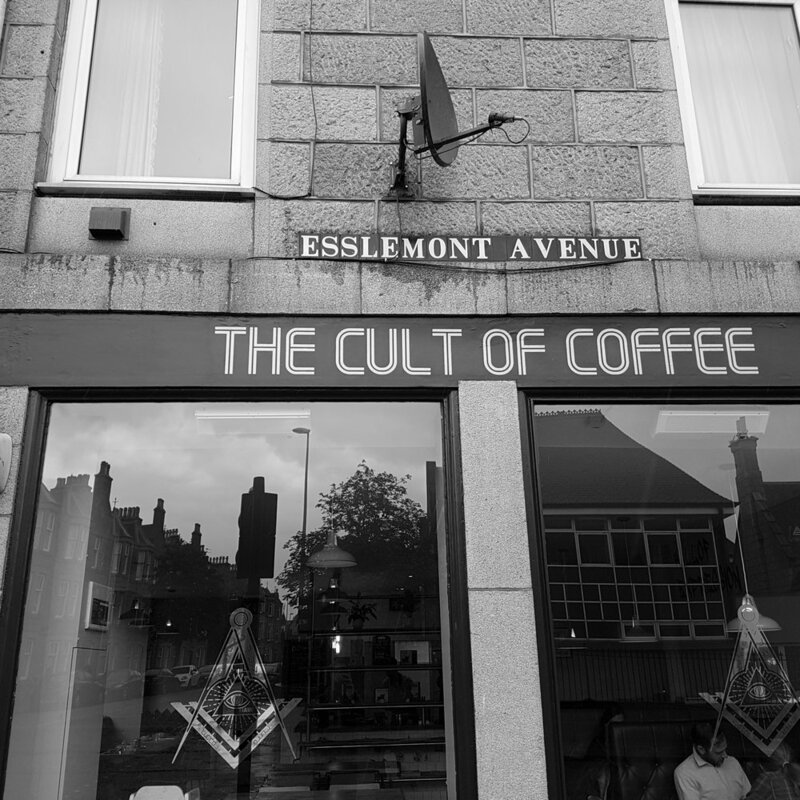 Situated at a set of traffic lights in the Rosemount area of the city, the Cult of Coffee occupies an ideal corner location, in full view from all directions. Big windows let in light and showcase the cafe to the outside world. The branding is distinctly masonic, with mysterious occult-inspired markings in the logo and on the tiles that line the bar. Inside, floor and tables are made from rustic wood, with a line of booths down the right hand side – a nice, diner-y touch. The bar is all the way at the back, behind a wood and recycled pipe shelving unit which displays retail coffee for sale as well as magazines and board games for perusing while you sip your latte. The bathrooms, ingeniously, are decorated with old comics – The Beano, Oor Wullie and The Broonsall feature – which is a charming, goofy touch as well as a great way to reuse old magazines. Coffee is supplied by Artisan Roast, with a pair of rotating single origins in use for manual brews at any one time, plus their Janzoon blend for espresso. A La Marzocco Linea provides said espresso, with a Mahlkonig EK43 grinder for support, although the position of the espresso machine at the back of the bar area is a bit of a strange choice, meaning the barista’s back is to the cafe while they do their thing. This pretty much negates any chance of interaction between barista and customer while the drinks are being made, if that's your thing. The owners tell me that they placed the espresso machine there in order to give more prominence to manual brewing, hoping to encourage more people to give pour-over a try. This, I can get behind. That counter space not inhabited by the Linea is instead taken up with cake. Lots of cake. Lovely cake. So far I have tried the chocolate and carrot offerings, and they are truly delightful. They also make their own (enormous) scones, but in the battle between scones and cake, it’s not really a fair fight: Cake. But the Cake Blog this is not, so on to the coffee. I’m a fan of Artisan Roast’s Janzoon blend as espresso – it is a bit old-school, leans towards the deep and sweet and nutty, and packs a wallop. And so it proved here, big bodied and smooth, with just a touch of tartness at the end. The flat white was not quite as successful, with the milk on the hot side, but it paired very nicely with a slice of chocolate cake, so I left happy. They also have Artisan Roast beans for sale, which is a bit of a godsend for Aberdonian coffee nerds – it is disappointingly difficult to to buy specialty coffee beans in this city, without driving out to the Coffee Apothecary (although it is a good excuse to visit). The Cult of Coffee has saved me a few times now when I’ve forgotten to place an online order in time. 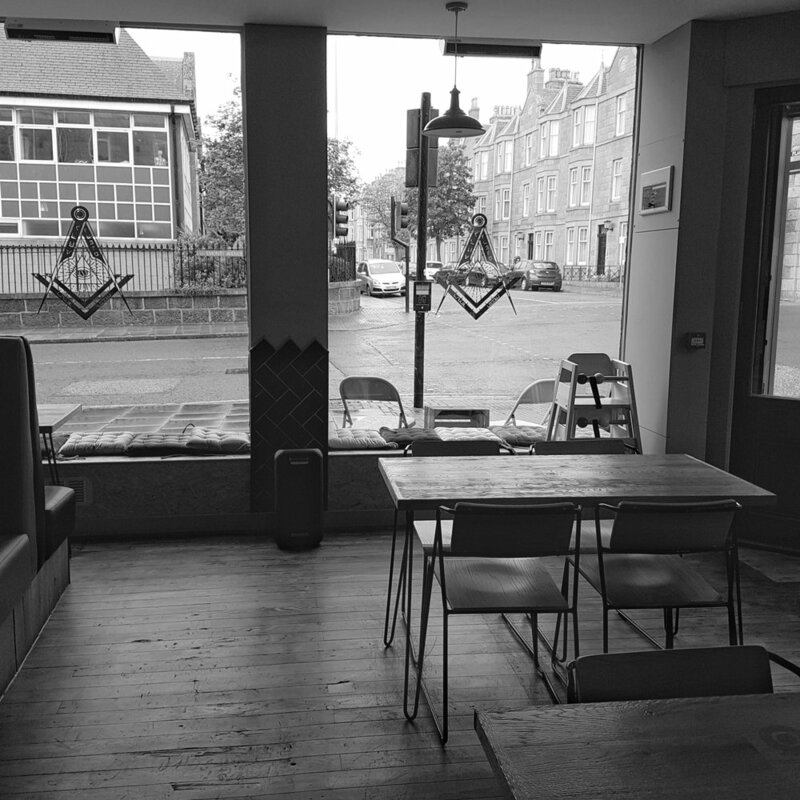 The Cult of Coffee is an exciting addition to Aberdeen’s nascent coffee scene. They have a good base to work from, and the number of customers stopping by while I was there is an encouraging sign. It’s a little off the main drag, but that means it can become a destination cafe, with the interested choosing to seek out specialty coffee, rather than settling for whatever’s nearby. I will certainly be frequenting.